Alan March (AM): Could you tell us about your academic and professional background, and how it led you to work in disaster risk reduction, climate adaptation and resilience? 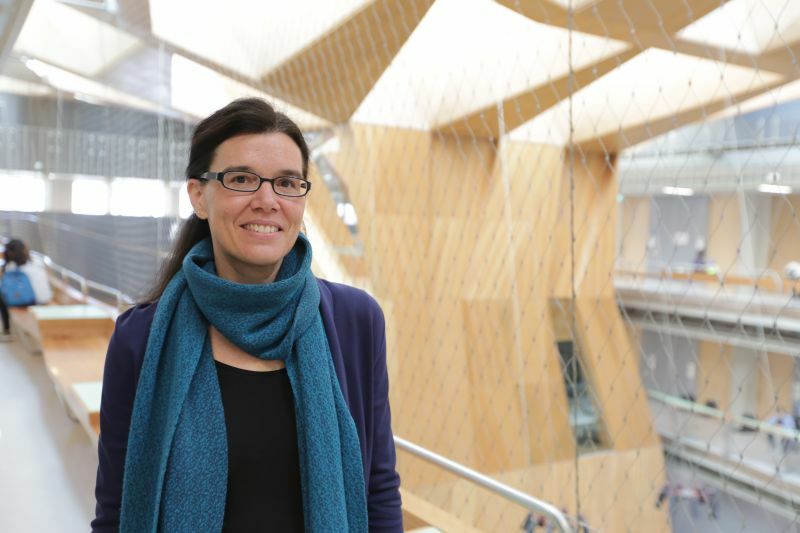 Christine Wamsler (CW): I’m originally trained as an architect and urban planner. I became increasingly interested in planning in Africa, Asia and Latin America, and I ended up specializing in this area in my Master’s degree. This helped me find work with the German International Development Corporation in West Africa during, and immediately after, my studies. I worked with informal builders in Togo for around 4 months. After that, I worked for a year in Mexico City with the so-called pepenadores – the people who live and work on waste-disposal sites. We assisted the Ministry of Environment in their efforts to create more sustainable waste management systems and processes. Through my early experiences of working with the urban poor and the most marginalised communities, I realised that these groups were outside of any formal planning framework. I felt that my architecture and planning studies were of little relevance to my work in the field. I therefore decided to return to university to study International Humanitarian Assistance. Through my work that followed I realised that architecture and planning perfectly complemented my humanitarian studies. It opened up many interesting work opportunities. In 2001, I was assisting with post-earthquake reconstruction in India, Peru and El Salvador, when the concept of disaster risk management started to gain international attention. Shortly after, the German International Development Corporation asked me to join their new Central American disaster risk management pilot program for a few months. They were not looking for the ‘usual suspect’. Instead, they were explicitly looking for an urban planner with experience in development and disaster-related work. At this point in time, disaster risk management was still focused on improving responses, and response preparedness, but they wanted to get somebody different in, they wanted to see how disasters linked in to the bigger picture. Since then, I have been investigating how urban planning, disaster and climate risk management are related to each other, and how they could be better integrated. In recent years, I have also increasingly looked into this in the European context. AM: It’s interesting that you mention you were not the ‘usual suspect’ for the pilot project. We still have this challenge of ‘responders’ or ‘uniforms’ being in charge of a lot of disaster risk reduction processes. Actually, urban planners should also be at the forefront of dealing with disaster and hazards. CW: Absolutely. Gradually, people have realised that it is the lack of adequate development, or adequate development planning, that is the main cause of our increasingly risky environments. Accordingly, there has been a shift from focusing on response, to recovery and finally on to development. This shift has been important for, finally, also addressing the root causes of risk. Definitely, I think the development context should be the main focus of disaster risk. But we always have to consider the whole cycle – from response, to recovery and development; risk reduction needs to be mainstreamed into all these processes. AM: You have nearly 20 years of work in this area, how has the focus and content of your work changed over this time? CW: Personally, I moved from focusing on response, to recovery, and then to development, which mirrors the international shift. I first worked on issues like temporary shelter and reconstruction, and then I moved on to much more long-term planning, urban governance and the issue of mainstreaming risk reduction and climate adaptation. Another big shift for me, was from a focus on Latin America, Asia and Africa towards Europe. This change was related to the increasing interest from European cities in climate adaptation and learning from areas that have been dealing with disasters and risk for decades. This shift in geographical focus also led to a change in cooperation partners. While I was previously mainly working with NGOs and local civil society organisations to help the most at-risk communities, in Europe I work mostly with municipalities, and more formal planning frameworks and governance structures. Despite these changes, several aspects have remained a constant throughout my work. I have, for instance, always been interested in the interface between what people do and what institutions do to reduce risk. Where are synergies? Where do they support each other? Where do they hamper each other’s efforts? In addition, throughout the years I have always been interested in the issue of mainstreaming, how risk reduction and adaptation can be mainstreamed into urban planning and governance to increase resilience. AM: Can you talk about what resilience is? CW: There are a thousand different answers to this question. Personally, I work on hazard and disaster resilience. In this context, it means creating an environment where we learn to live and cope with an ever-changing, and sometimes risky, environment. It’s about making society capable of resisting, coping and dealing with an ever-changing environment. AM: How does adaptation fit in with that definition? CW: Mainstreaming climate adaptation is one way to increase urban resilience. Adaptation mainstreaming means the integration of climate considerations into policy and practice in all sectors, including urban planning, to reduce risk and, ultimately, increase resilience. AM: We need to engage with governments as part of a wider set of organisations and decision-making process to have some chance of integrating action. This is one of the big challenges of urban planning: to find ways to make change that is going to be acted on, and that is acceptable to the wider population, so it’s not an artificial imposition on people’s behaviour. In my work in bushfire-prone communities, if you introduce measures that are too onerous it just doesn’t work as it doesn’t fit with how people are going to live their life. CW: Definitely, we have to make changes that are relevant to people’s everyday life. We have to approach people with compassion and respect, acknowledge their needs and priorities. Academic terms, like resilience or adaptation mainstreaming are not necessarily the terms people are using or identify with. AM: Could you elaborate a bit more on this? What does adaptation mainstreaming to increase resilience mean to you, and why is it so important for architects, planners, and other urban actors to understand and apply it in the context of their work? CW: Climate adaptation mainstreaming, as a concept, has two main origins. One is that it developed out of risk reduction mainstreaming, which has had strong international support since the World Conference on Disaster Risk Reduction that was held in Japan in 2005, and is based on the mainstreaming experience of other cross-cutting domains such as HIV Aids and gender. The second origin is environmental policy integration, and more specifically climate policy mainstreaming, which initially only focused on integrating the goal of reducing greenhouse gas emissions into sector policy but, during recent years, has also started to explicitly include adaptation considerations. AM: What does increasing resilience through adaptation mainstreaming mean at a local level? We have talked about very different environments like Africa, Asia, Latin America, Europe – are there common themes that run through a resilient place? CW: At the local level, increasing resilience means the modification of on-the-ground activities in order to take risk and climate considerations into account. It requires the active consideration and combination of five different types of measures to reduce risk at the local level. These measures are: hazard avoidance, hazard reduction, vulnerability reduction, preparedness for response, and preparedness for recovery. In simple terms, this means that even if you are a planner or another professional who ‘only’ works in a development context, you cannot ignore response and recovery; it is part of the same story. It’s important to know, and ultimately address, all five measures, because local resilience is not about the effectiveness of a single measure, it’s about the inclusiveness and flexibility of the combined set of measures that are deployed. By ‘inclusiveness’, I mean not just addressing one or two, but all five types of measures to reduce risk comprehensively. By ‘flexibility’, I mean the number and diversity of activities employed for each of these five measures. In fact, it is crucial that we do not only work on reducing physical risk with so-called grey measures. Instead, we need a combination of grey, green and soft measures to address physical, social, economic and environmental risk factors at the same time. However, physical measures can also become an important entry point for reducing broader, socio-economic vulnerabilities, for instance by linking them to professional training and economic activities that support those most vulnerable. AM: So, in contrast to the local level, what are the key elements of mainstreaming adaptation at an institutional level? CW: Mainstreaming means that organisations themselves also need to change, rather than simply ‘mainstreaming’ change in selected, on-the-ground measures. Changes at the institutional level address institutions’ internal organization and cooperation, together with their policies and regulations. Concrete measures might, for instance, involve the creation of inter-departmental working groups for climate adaptation, changes in mandates or financing schemes, and the inclusion of adaptation considerations in comprehensive and detailed planning, and associated planning tools. The mainstreaming strategies that focus on the inter-institutional level relate to sector work and professions in general, and the broader system. They address external cooperation with other organizations, including businesses, universities and citizens. This might, for instance, involve joint risk and vulnerability mapping, or municipal participation in regional innovation platforms to create new cooperation, business and policy models for managing climate adaptation. Mainstreaming needs to take place at all levels – the local, institutional and inter-institutional – in order to achieve sustainable change, by uniting top-down and bottom-up efforts that together can lead to a holistic and distributed governance system for climate adaptation. AM: It’s often the case that there are key impediments to introducing changes. In my work I have encountered certain regulations that just seem to create their own reality for people working in larger organisations. Essentially, we need a lot of people to agree to do something and it’s often easy for one individual to derail or halt the whole process. CW: Yes, what you describe is a situation where climate adaptation is not yet mainstreamed into the system. Then, it can be a very time-consuming process, which can be easily disrupted by a single person. Therefore, adaptation needs to become standard procedure, including the establishment of mechanisms and structures for monitoring and learning. It has to be considered by default. That’s the aim of adaptation; that even if you don’t think about it consciously, it would still be considered because it is an integral element of planning tools. At the university level, if we manage to get adaptation and risk reduction thinking mainstreamed into our education, then future generations will take it on board, see it as part of their profession, and build it in automatically. AM: Good planning can sometimes be brutal. At some point, we need to say ‘this is the new policy or regulation, and we are going to stop discussing it’. For instance, when seatbelts were made compulsory in cars in 1972, there was much discussion. Now, it’s automatic, we don’t think about it anymore and it’s been a major benefit to car safety. Sometimes you need to think of the benefit of removing the debate. CW: That’s a good example. Sometimes I use the ‘washing the hands’ analogy. You don’t think about what type of bacteria is on your hands before you wash compared to after; you don’t have to know, you just do it. You know it’s important. It’s the same with adaptation; it can be built into systems and processes. AM: You have also done a lot on citizen involvement work. Why is citizen involvement important, and how does it fit in with risk reduction and climate adaptation? CW: As I’ve highlighted earlier, cooperation with different stakeholders, including citizens, is an important part of adaptation mainstreaming. It’s also in line with the widespread consensus that adaptation requires transdisciplinary processes to be sustainable. That means the active involvement of different types of stakeholders, both academic and non-academic, and working across disciplines. Traditionally, the emphasis has been on input from corporate stakeholders like insurance agencies, private companies and universities. Citizens’ involvement has often not been given enough importance. But it is crucial. Firstly, because climate impacts are local, and mostly affect private land. Secondly, people are always the first on site. They are a key resource. In addition, the increase in climate extremes has shown to lead to shifts in responsibilities towards citizens. No single actor has the capacity to adequately manage risk; it’s about how to bring together different capacities and needs. In theory, adaptation policy should support individual adaptation, and when that fails, provide public adaptation. However, in practice individual adaptation is not really looked at much. There’s little knowledge about what individuals do to reduce their own risk, how it relates to the five risk-reducing measures I mentioned previously, how it links to other stakeholders’ efforts, and how the different efforts support or hamper each other. AM: That’s timely for us here in Australia. The reality is that a government cannot take complete care of everyone all the time. We can achieve great things when we build on the incredible resilience of people and communities, and this is obvious when we look at how successful the Country Fire Authority system here in Australia has been at building and adapting resilience within communities. CW: Yes, there are some good examples of citizen involvement and city–citizen cooperation for climate adaptation. But these are exceptions. Also, in some contexts people are extremely active in reducing their own risk. I’ve seen this in many marginal communities in Latin America I have worked with. This contrasts to my work in Germany and Sweden where people are more passive. They rely heavily on the formal system to provide a safe, resilient environment. Part of the problem is that authorities have too often promoted the so-called protection paradigm – the idea that they can fully protect their citizens with physical measures – this has inadvertently created a false sense of security and, to an extent, a passive mentality. AM: Absolutely. Through my work in the bushfire field, I’ve met people who are shocked to find out that some of the standards we have built the code on are designed to not save the actual house in the instance of a fire, but to save the people sheltering in the structure. There are interesting little assumptions underlying how much risk can be removed from the situation, and how much we need to try to empower people themselves. AM: You have also begun looking into the importance of inner transition and practices such as mindfulness. How does that fit in to the picture? CW: If you look into the literature on urban resilience, the focus is generally on a larger, systems perspective, but there’s very little on the individual’s mind and emotional wellbeing as an important factor for resilience. There is a gap between systems and individual approaches to urban resilience, and I would like to see how they can be better linked. Another reason why work on this issue is crucial is because it is becoming increasingly clear that climate change and disasters cannot simply be solved by new technology and governments alone. We need a more profound shift, a cultural shift, we must completely rethink how we do things. I thus wanted to look into resilience from the other angle, starting with the individual and the impacts on the larger system. My recent work has, for instance, shown that an individual’s mindfulness disposition can influence their risk perception, their environmental behaviour, and how motivated they are in terms of engaging with climate change themselves or supporting organisations who are engaged. How can mindfulness influence mainstreaming at the institutional level? It can influence issues such as climate communication, social justice, and an organisation’s reliability and innovation, from the bottom up, all of which are crucial in supporting those who are most at risk. 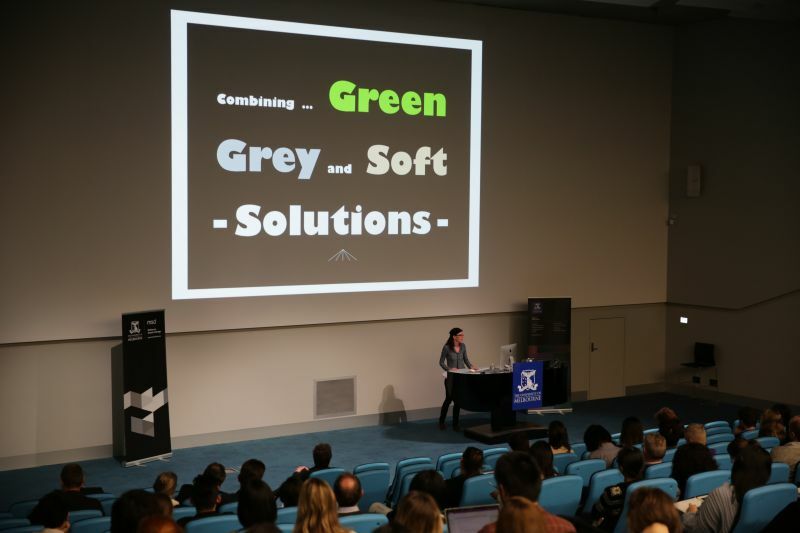 Professor Christine Wamsler presenting at the Dean's Lecture Series in October 2017 at the Melbourne School of Design.